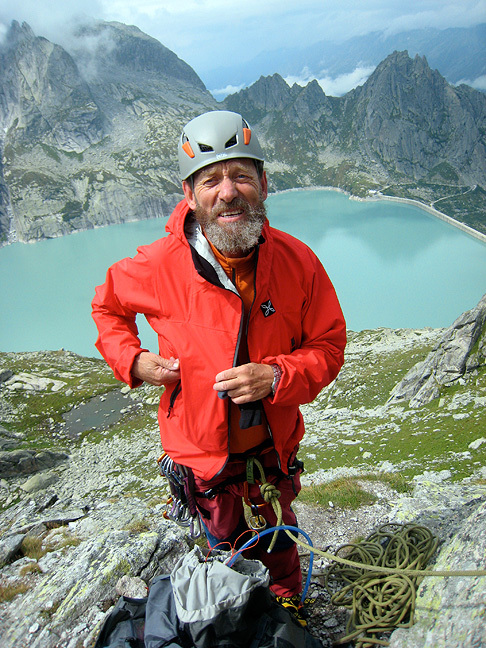 Mike Starr from Israel spent 10 days climbing with both Mark and Kathy. 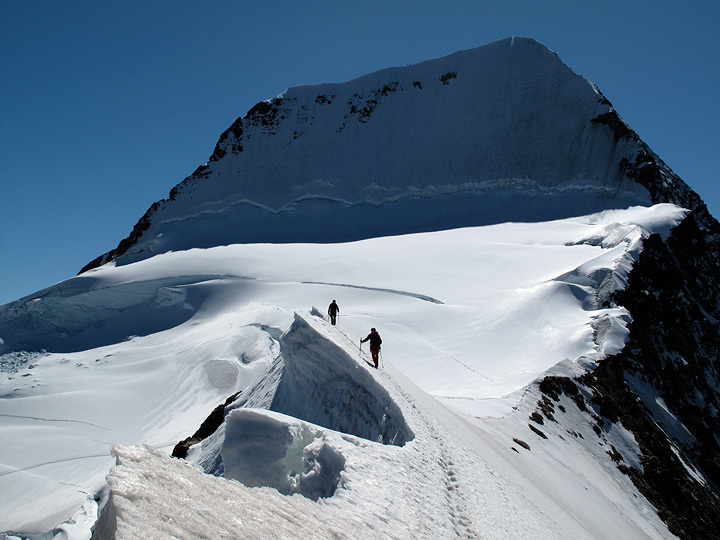 To begin, they made ascents in the Saint Moritz area including the Piz Bernina and a traverse of the summits of Piz Palu. 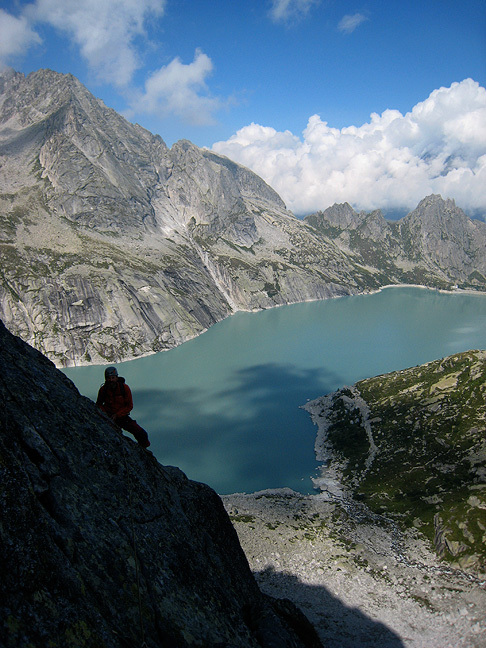 Next, it was on to the rock climbing in the Albigna area, not so far away. 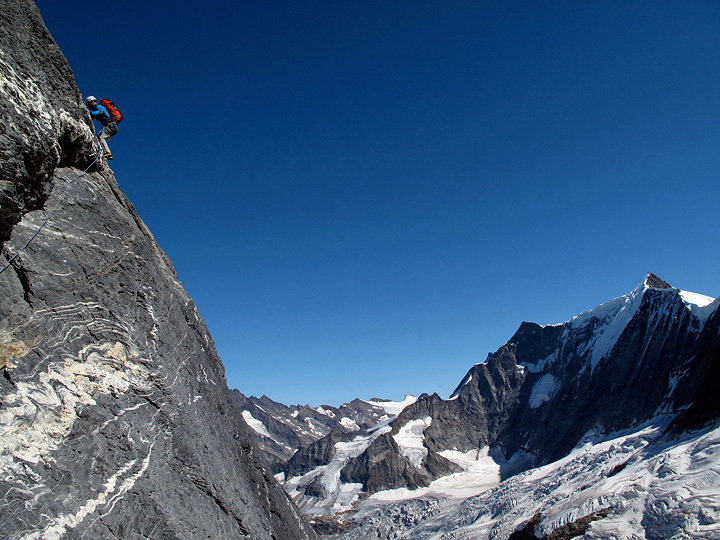 After a short break Mark and Mike climbed the Eiger's Mittellegi Ridge, as well as the Jungfrau, both in perfect weather. 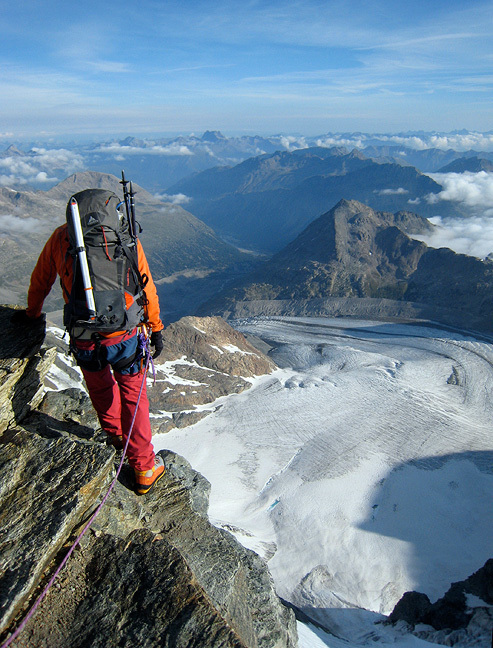 With more dubious weather in the forecast, they retreated to Zermatt, and climbed on both the Riffelhorn as well as the Jegihorn, close above Saas Grund. 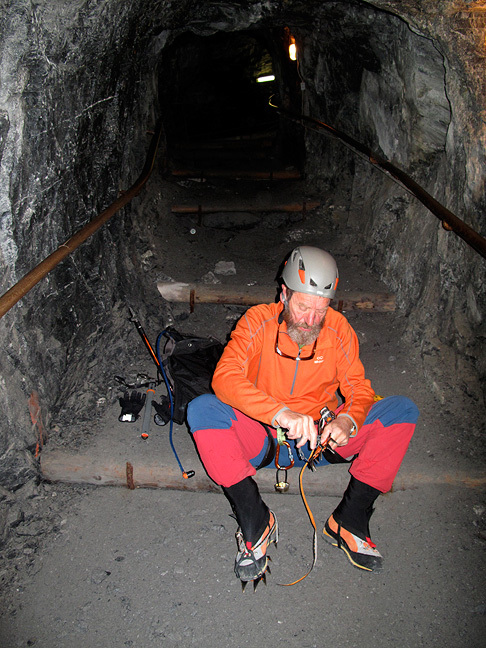 Mike getting ready for the next pitch, above Albigna lake. The red line shows Mike and Kathy's program for the first few days. 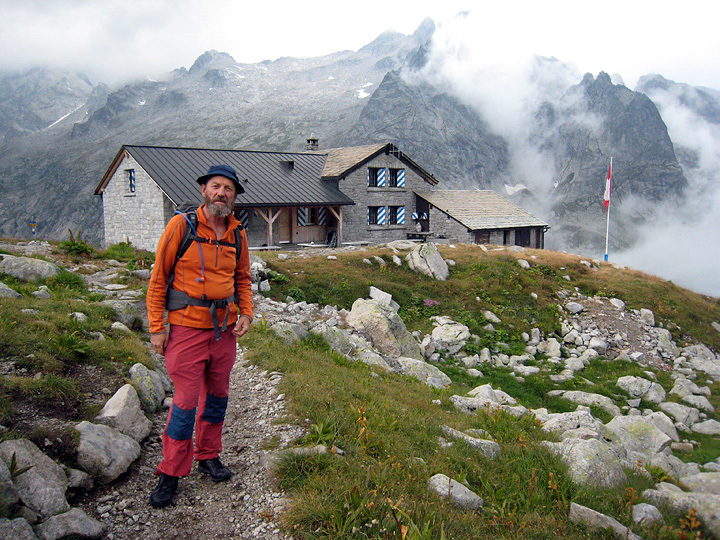 We met up early in the morning to take the first cable car to the Diavolezza hut, then carried on up the glacier to the Marco e Rosa hut via the Fortezza (the first left-ward jog of the line, following the rock ridge). 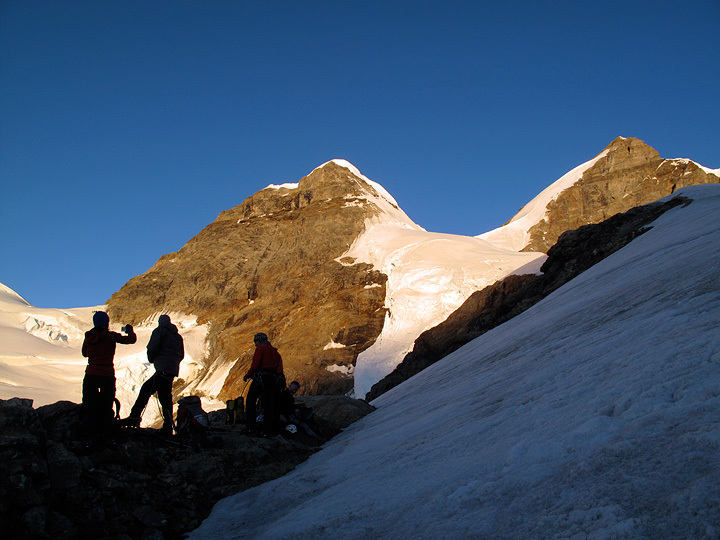 The next morning we climbed Piz Bernina in nearly perfect weather. Conditions a bit dry, but good. Mike maneuvers along a short but sweet section of exposed ridge. Waiting our turn for space on a narrow section, we are nearly on top (just beyond the furthest climbers in this photo). 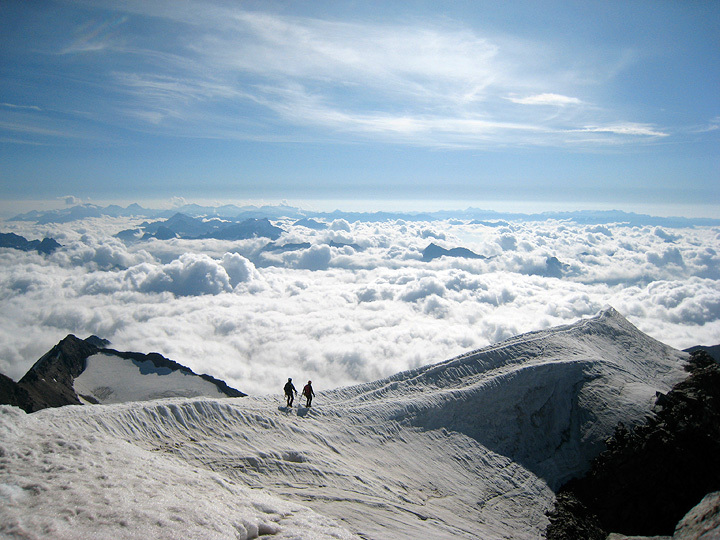 The next morning we climbed Piz Palu on our way back to civilization. 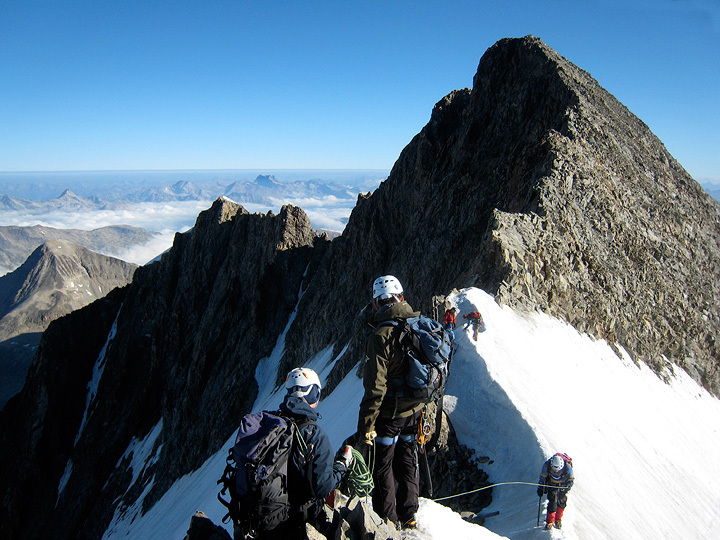 Here we follow a couple of parties to the beginning of the West-to-East traverse. 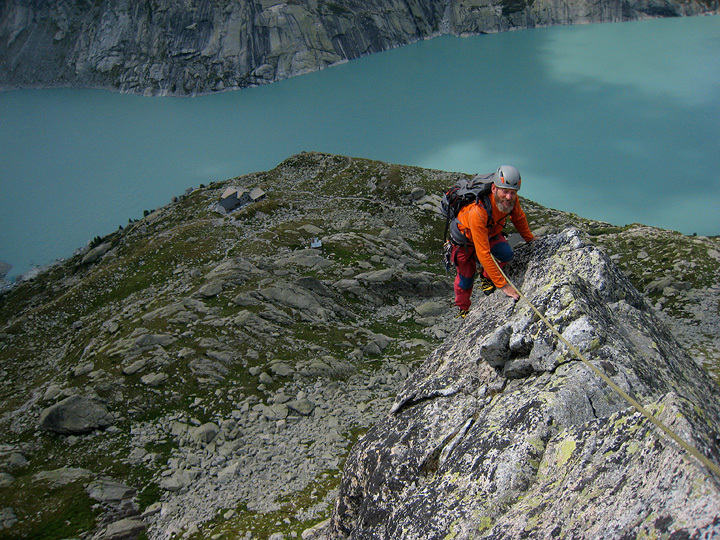 Mike scrambling along the exposed and scenic ridge crest. Pausing to take in the view, we look down on terrain covered a couple of days previously. 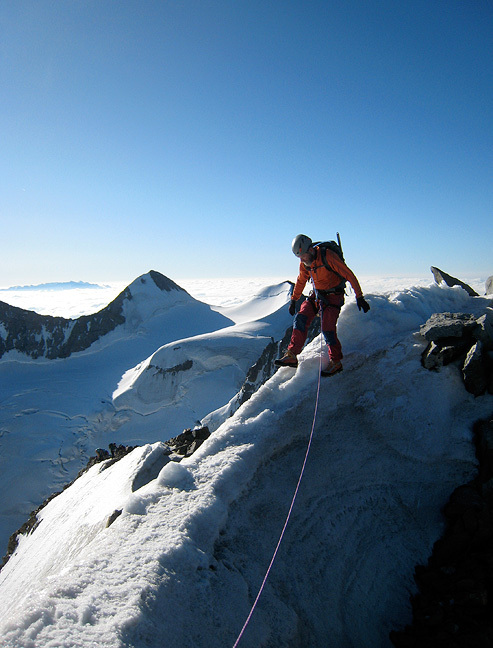 A couple of other climbers precede us down the snow and ice ridge. 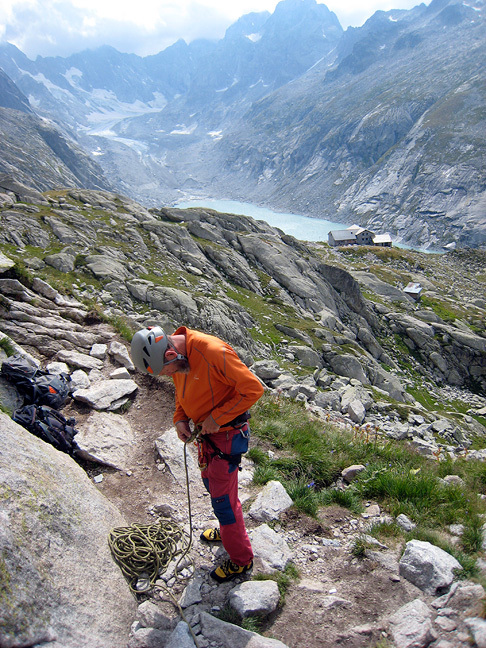 After Bernina and Palu, we moved on to the Albigna hut for some rock climbing. Arriving at the hut late on a rainy morning, we start up nearby Piz dal Pal as the sun begins to show its face between squalls. 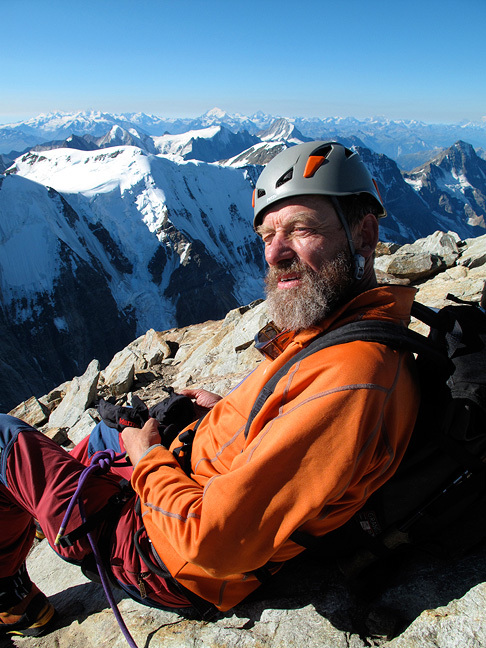 Mike nearing the top of Piz dal Pal. 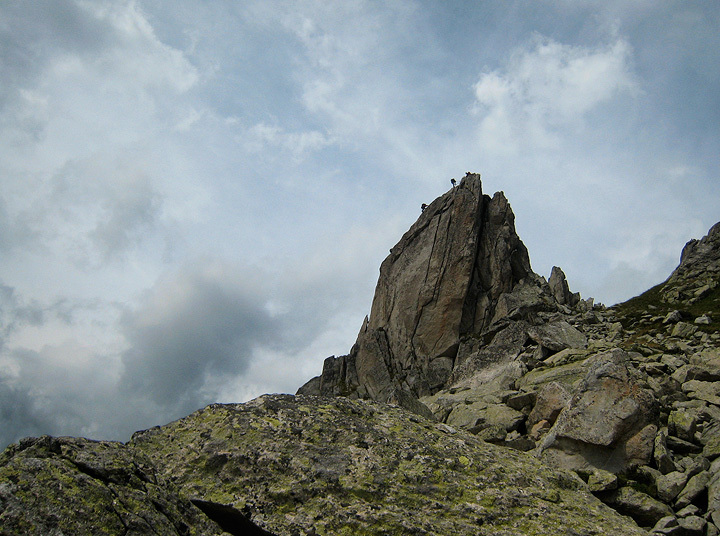 Other climbers topping out behind us as we descend the boulder field back to our cache. The next day (our last together) we headed up Punta Albigna. Much better weather, as you can see. Not having found a way across the glacier-fed stream without getting our feet wet, we try to dry out as we hike back to the hut. And now for something completely different. 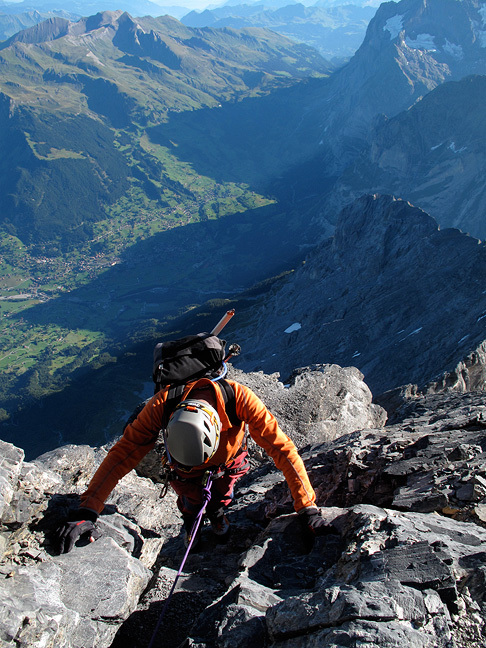 After a short break, Mike joins Mark for our first climb, the Eiger's Mittellegi Ridge. The start is indeed odd. Exiting the Jungfraujoch railway at the Eismeer station, we walk down an icy tunnel to pop out onto the glacier below. After a traverse across the glacier, we have a couple pitches of interesting rock climbing to get to more reasonable broken ledges that lead to the hut. 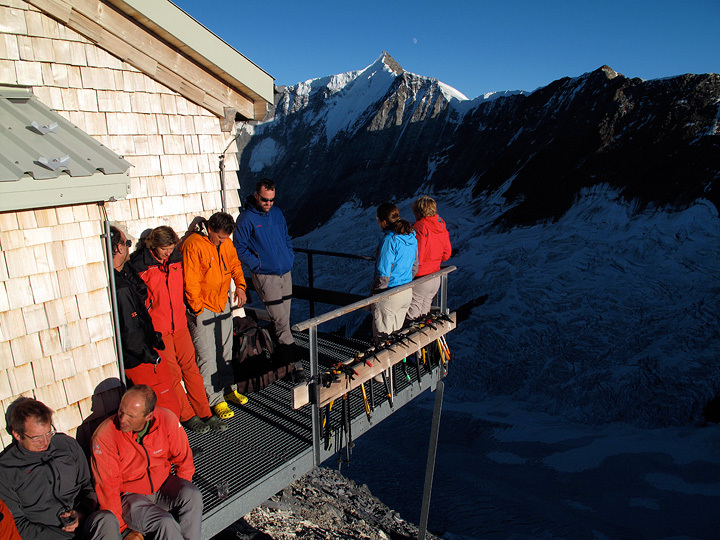 Climbers at the Mittellegi hut enjoy the last warmth of the sun. 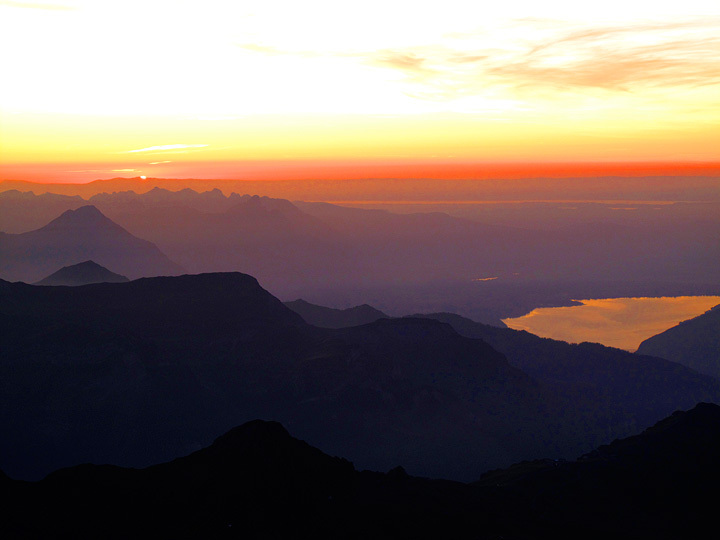 Sunset from the Mittellegi hut. The lake is the Thunersee. 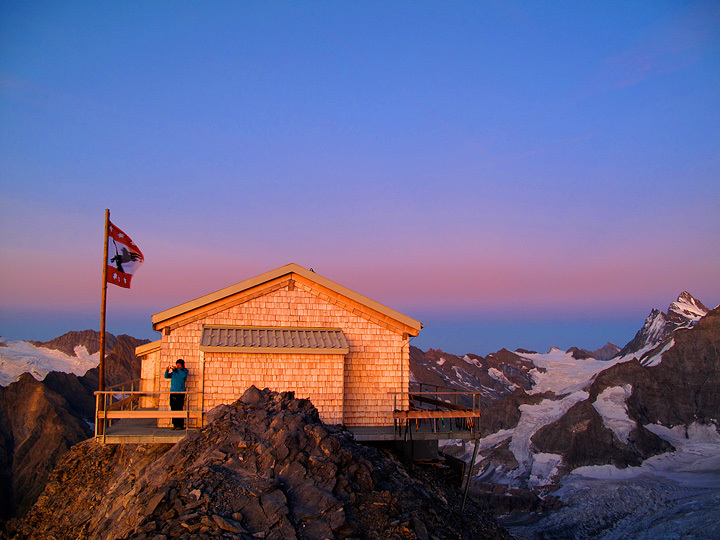 A sunset view of the Mittellegi hut. 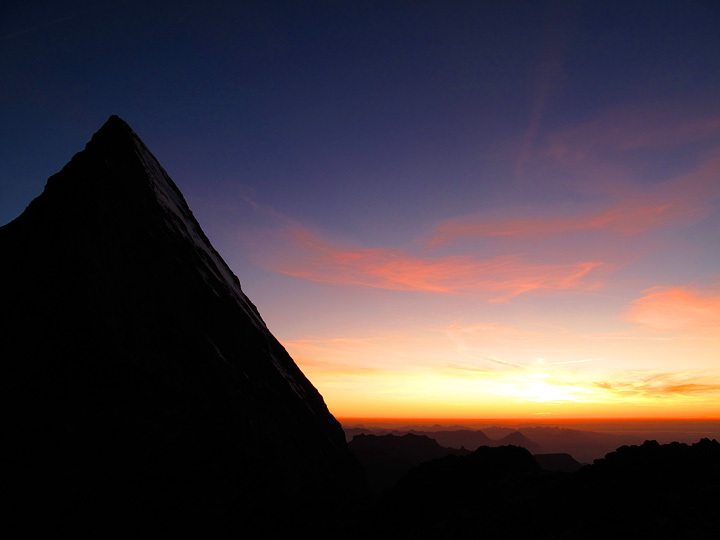 The following morning, high on the ridge with the Grindelwald valley far below. 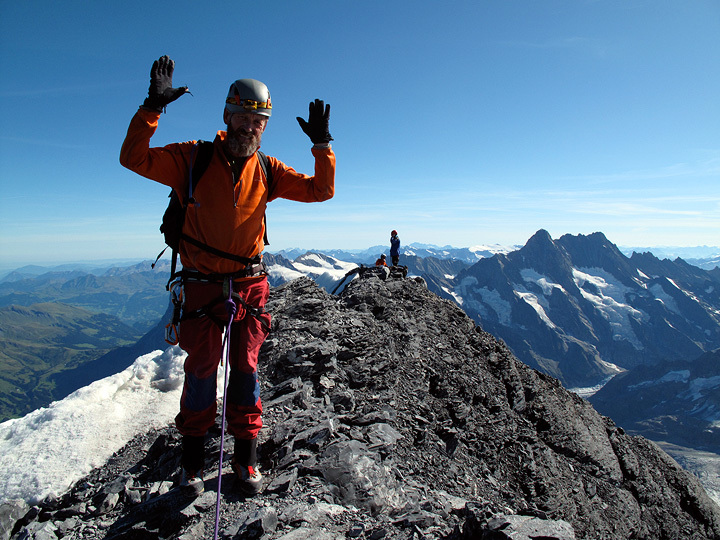 On the summit of the Eiger. 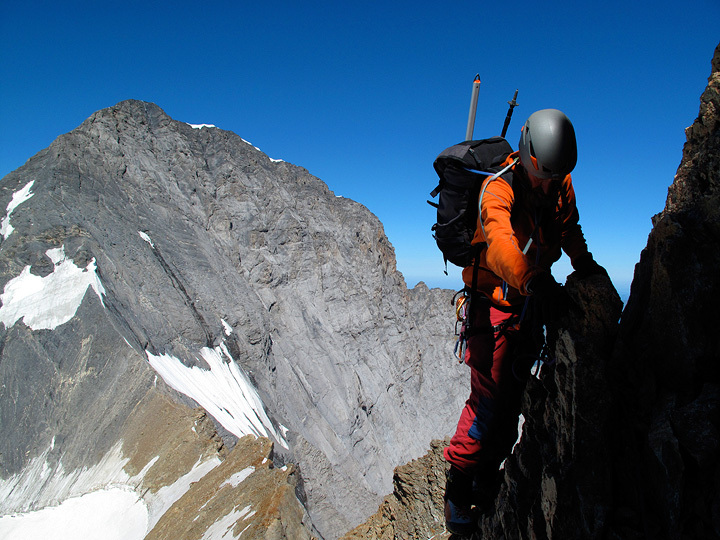 The descent of the South Ridge takes longer than the climb of the Eiger. 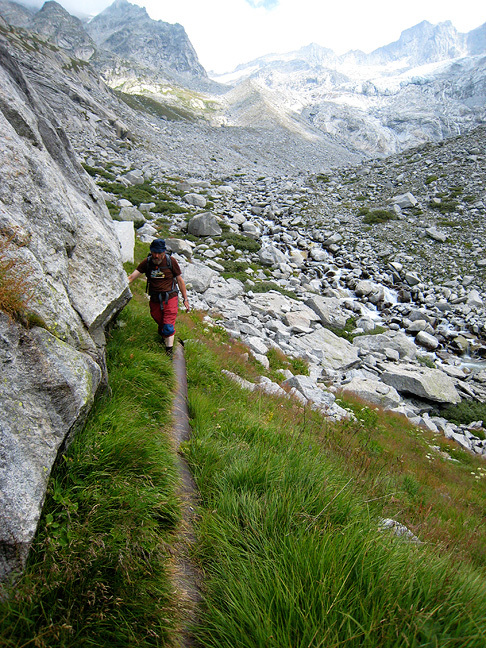 Here, we traverse one of the many towers between the Eigerjoch and the easy glacier below the Mönch. 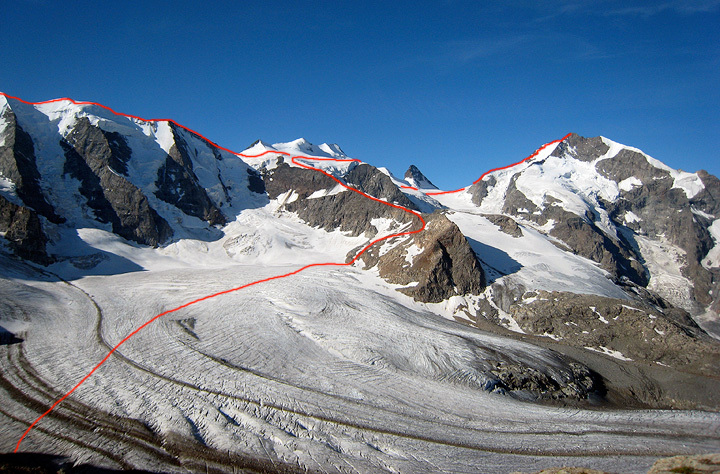 Finally, easier climbing and the glacier walk back to the Mönchsjoch hut. 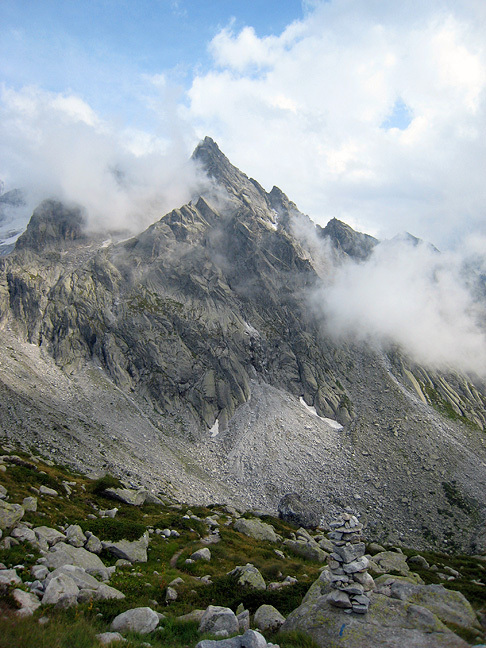 The North Face of the Mönch in the background. 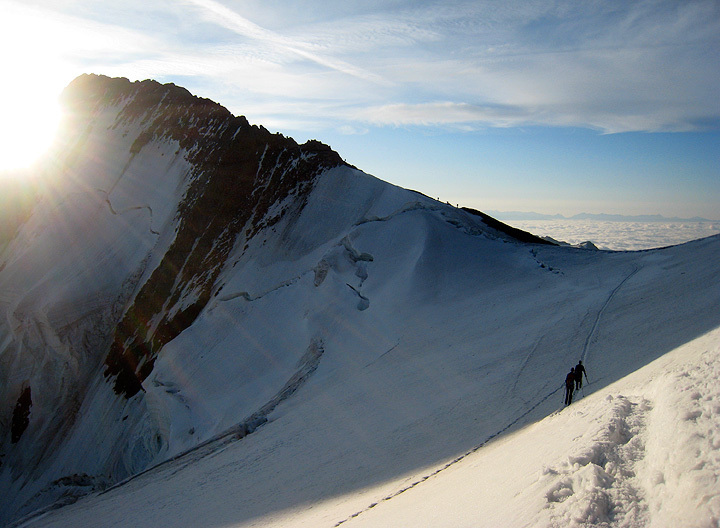 For the following day, we climbed the Jungfrau. Late season conditions were quite icy, but the weather was perfect. 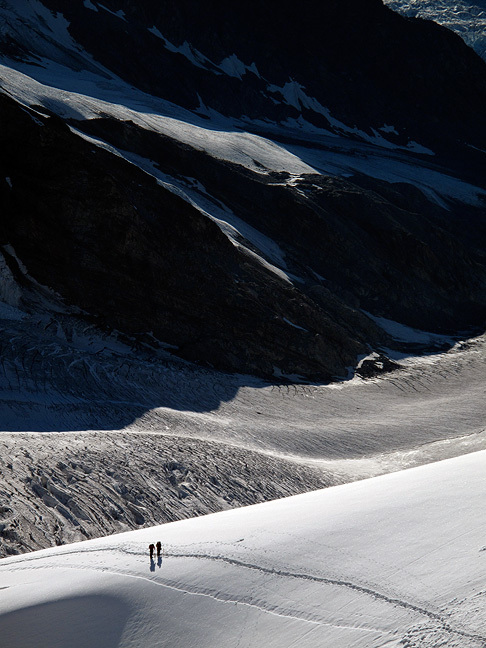 Looking down on climbers above the Aletsch Glacier. 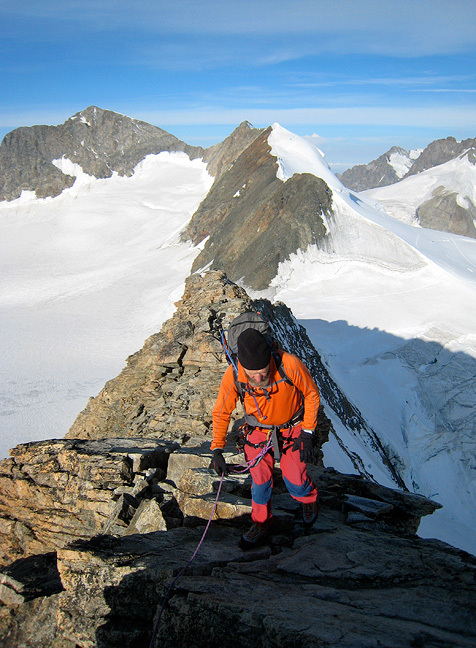 Mike on the summit of the Jungfrau. 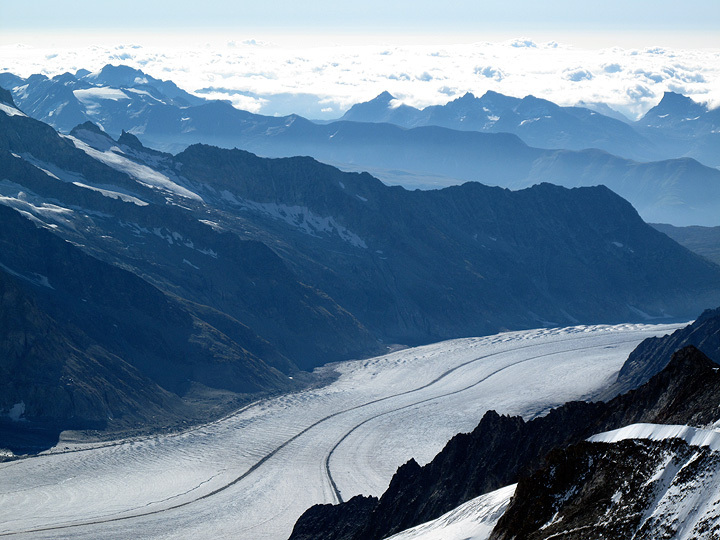 The view to the southeast, down the Aletsch Glacier. 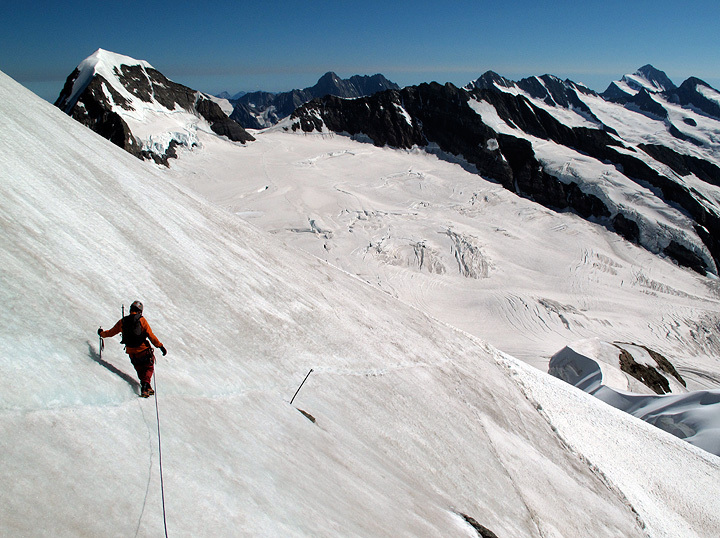 An icy traverse leads to easier climbing and a quick descent back to the Jungfraujoch. 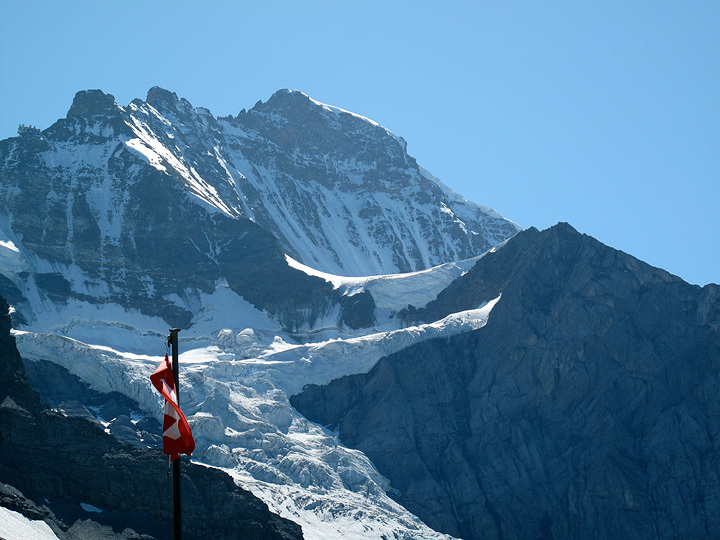 One last view of the Jungfrau, this one from the Eigergletscher station. 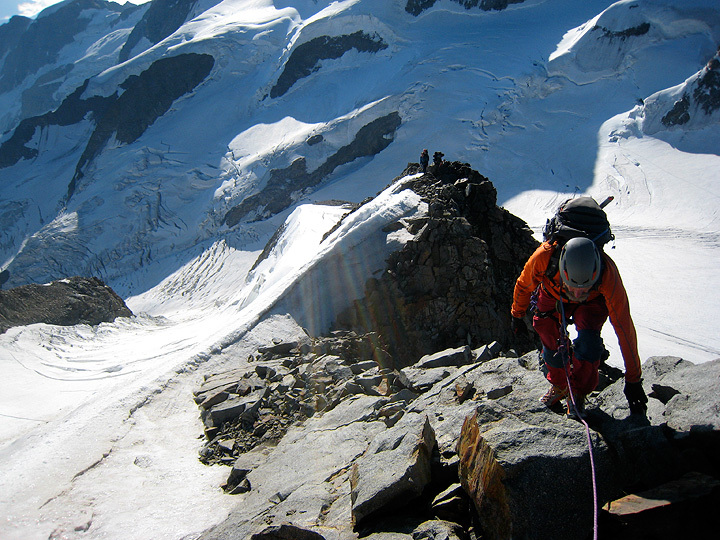 We continued on to Zermatt this day, and the following two days climbed on the Riffelhorn, as well as the Jegihorn. Unfortunately, I have no photos from this climbs. Oh well.